Card Text Play: Return 2 enemy creatures to their owner’s hand. 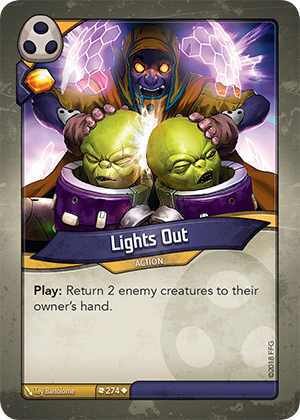 Can I still play Lights Out if my opponent has less than 2 creatures in play? Yes. You always resolve as much of an ability as possible. Therefore, if your opponent has 1 creature in play, you return it to their owner’s hand. If your opponent has no creatures in play, you can still play Lights Out just to get the Æmber bonus.